What was going on in the Museum’s oak trees last spring? 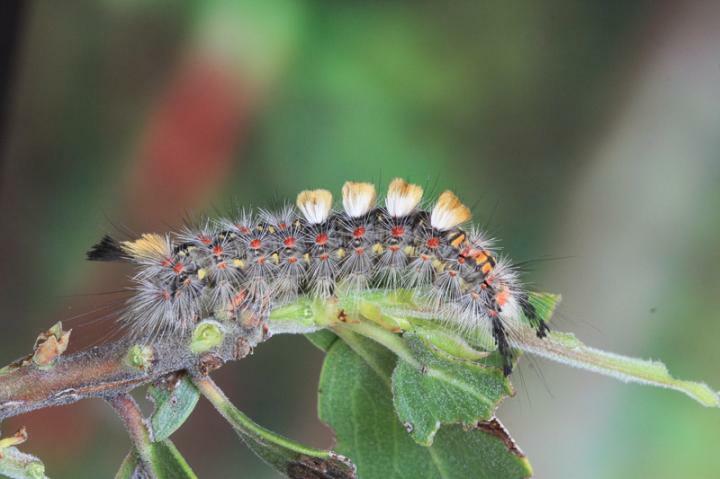 It was the yearly ritual between the Western Tussock moth, its caterpillar, its cocoon and the insects and birds that love to eat them! As occasionally happens, due to warm dry weather, last year there was a heavier than usual spring infestation. We had caterpillars dropping down on their threads from the museum’s Pacific Coast Live Oaks occasionally causing painful itchy rashes on sensitive skin. They marched onto the J. Gilbert Smith House porch to build sticky cocoons between the exterior wall’s shingles, onto all surfaces of the picnic tables, onto any plant in their way—actually, on everything! In part, we were rescued by parasitic tachinid flies, various spiders and viruses and fungi, and the all familiar yet unpopular Western yellow jacket wasp. They all eat the developing caterpillars still in the boughs, which helped limit the numbers coming down. The three little birds that live in our area full time and eat both the Tussock moth and its caterpillars, are the Oak Titmouse, the Bushtit and the Bewick Wren. As amazing as it may seem, all of these helpers were called to by the trees! It has been reported in the bestselling book The Secret Life of Treesthat as a tree is attacked, it sends out a specific pheromone that attracts the very predator that eats that particular pest! 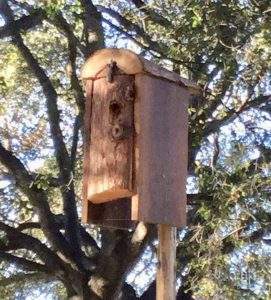 Our museum garden now has a custom-made birdhouse for the Oak Titmouse built by Erik Rauch (of Los Altos) from a redwood log. An assortment of bird house plans are available on the Audubon website and in their books. Ready-made ones are available at the Los Gatos Bird Watchers store where they advise that the birdhouses go up by January or February. If you want more detailed information about the caterpillars or any other bugs, visit the UC Integrated Pest Management Program site. Contributed by museum garden volunteers Caroline Landsbergen and Margie Rauch.